1st Viking cruise. Travelled Adriatic Sea from Venice. Did the pre cruise hotel stay at Hilton Molino Stucky and enjoyed the hotel and location despite it not being in Venice proper. Embarkation was smooth and we enjoyed our first meal in the World Cafe. That became our favourite venue for dinner as the aft deck was wonderful to sit out for dinner and catch the sail out and the sunset every evening. We did have a gourmet dinner at Manfredis one night but could not resist sampling the delicious offerings at the World Cafe. The supervisor Casper came around each evening to make sure we were enjoying ourselves and had what we wanted as did the rest of the wait staff. The ship is stunning from bow to stern. We tried to check out each area and the Explorer&apos;s Lounge was a favourite for a relaxing drink while following our path. Viking has thought of everything a cruiser might want and some they don&apos;t even know they want. Our cabin was starboard 3rd deck. 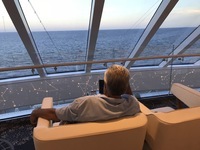 We treated ourselves to room service every morning and enjoyed coffee on the balcony as the sun rose in all our ports. Our cabin attendants Arvin and Rustille kept our room spotless and were in tune to our needs for sure. Lots of storage space in the cabin and bathroom. I took a hanging storage item but really did not need it. Amenities were wonderful and plentiful . Lots of USB ports and plugs. We had a mix of included tours, optional tours and private tours and were pleased with all we chose. They were very organized to get us all off the ship and in our proper busses and one day they had a big dance party to welcome us back! Always provided water to take with you and cold cloths to welcome you back. I really can&apos;t speak about the entertainment as we were always too tired to attend the events. Up by 6, breakfast at 7 and off the ship by 8. The heat necessitated a rest and a shower prior to dinner which always ended at 9 when the sun went down. After that it was back to the cabin to enjoy a drink on the balcony and look at the stars. The port talks are available on the TV which we watched at our leisure and they were repeated in the theater as you waited for your tour to be called. All the staff could not have been more professional and hospitable. Smiling as they go about their day offering to help you in any way. I trust they enjoy working for Viking. Do not hesitate to travel with Viking however do your research to determine the type of cruise you desire. If it&apos;s a huge pool and recreation, gambling and glitzy shows look elsewhere. If you want personal service, gourmet dining, relaxation and top notch port excursions then consider Viking. 1st Viking cruise. Travelled Adriatic Sea from Venice. Did the pre cruise hotel stay at Hilton Molino Stucky and enjoyed the hotel and location despite it not being in Venice proper. Embarkation was smooth and we enjoyed our first meal in the World Cafe. That became our favourite venue for dinner as the aft deck was wonderful to sit out for dinner and catch the sail out and the sunset every evening. We did have a gourmet dinner at Manfredis one night but could not resist sampling the delicious offerings at the World Cafe. The supervisor Casper came around each evening to make sure we were enjoying ourselves and had what we wanted as did the rest of the wait staff. The ship is stunning from bow to stern. We tried to check out each area and the Explorer&apos;s Lounge was a favourite for a relaxing drink while following our path. Viking has thought of everything a cruiser might want and some they don&apos;t even know they want. Our cabin was starboard 3rd deck. 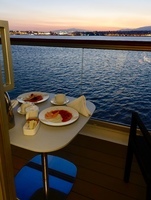 We treated ourselves to room service every morning and enjoyed coffee on the balcony as the sun rose in all our ports. Our cabin attendants Arvin and Rustille kept our room spotless and were in tune to our needs for sure. Lots of storage space in the cabin and bathroom. I took a hanging storage item but really did not need it. Amenities were wonderful and plentiful . Lots of USB ports and plugs. We had a mix of included tours, optional tours and private tours and were pleased with all we chose. They were very organized to get us all off the ship and in our proper busses and one day they had a big dance party to welcome us back! Always provided water to take with you and cold cloths to welcome you back. I really can&apos;t speak about the entertainment as we were always too tired to attend the events. Up by 6, breakfast at 7 and off the ship by 8. The heat necessitated a rest and a shower prior to dinner which always ended at 9 when the sun went down. After that it was back to the cabin to enjoy a drink on the balcony and look at the stars. The port talks are available on the TV which we watched at our leisure and they were repeated in the theater as you waited for your tour to be called. All the staff could not have been more professional and hospitable. Smiling as they go about their day offering to help you in any way. I trust they enjoy working for Viking. Do not hesitate to travel with Viking however do your research to determine the type of cruise you desire. If it&apos;s a huge pool and recreation, gambling and glitzy shows look elsewhere. If you want personal service, gourmet dining, relaxation and top notch port excursions then consider Viking. Well appointed, lots of storage. Spent loads of time on the balcony. In future I would book port side as the ship seemed to dock at each port with starboard facing the port facilities . Not always pleasant.